in harmony with our deepest essence. 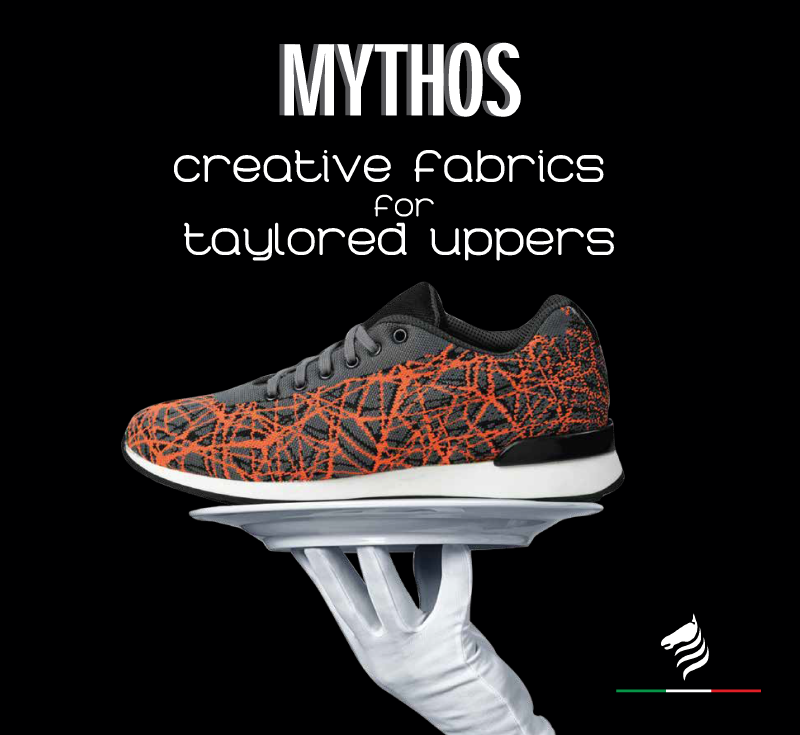 Production of a wide range of technical articles made of Non-Woven, latex foams and knit cloths, designed to meet all the needs in footwear for any type of shoe construction. Production of technical textiles designed and made to meet many industrial needs with particular reference to the plotter cutting sector. A wide range of open cells, latex foams, for every application (with a special attention to the footwear). Breathable, elastic, thermo-mouldable and above the line L-MEMORY: the superior self-lasting viscoelastic foams. Technical nonwoven fabric made of fire resistant fibres, without chemical treatments, designed to meet all the needs of the public transport sector, protective clothing and upholstery. Production of technical articles made of non-woven fabric that is highly resistant to cutting and punching, and ballistic protection, free of chemical binders, designed for the production of protective clothing, work wear, for dangerous activities or extreme sports. Production of agro-textiles felts, for mulching with high water reserve made of natural and Super Absorbent fibres, no chemical binders, designed to meet the needs of the horticultural industry. 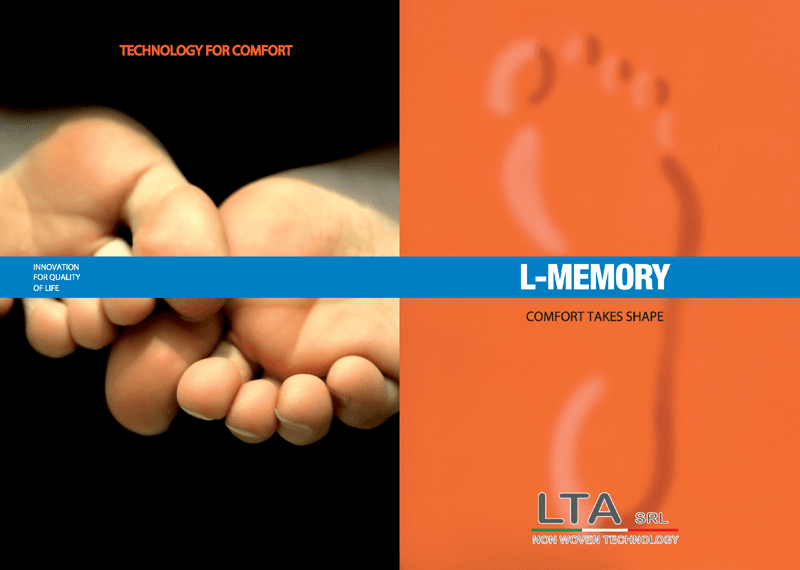 LTA srl offers a range of technical articles made of non-woven fabric and foams designed to meet all the needs in footwear for each type of shoe construction. For safety shoes, classic shoes for men and women, for sports shoes, hiking boots or sneakers and "home slippers": a full range of technological and quality materials made and tested thank to years of experience for the final solution in all stages of assembly of the shoe. We manufacture tailored products for any specific requirement or printed with customer’s logo or brand, using an high definition ink-jet technology. 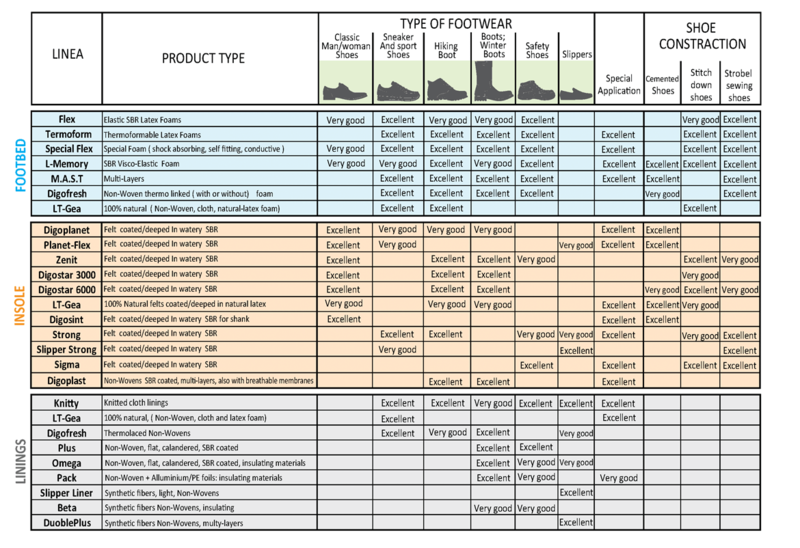 The images below and the summary table shown here, summarize the wide variety of technical products and fashion materials available in our product range. By clicking here you can download the synoptic information. • Felt for insulating application of buildings and machinery. LTA produces in its plants a wide range of latex foams to open cell, water based, breathable and elastic. 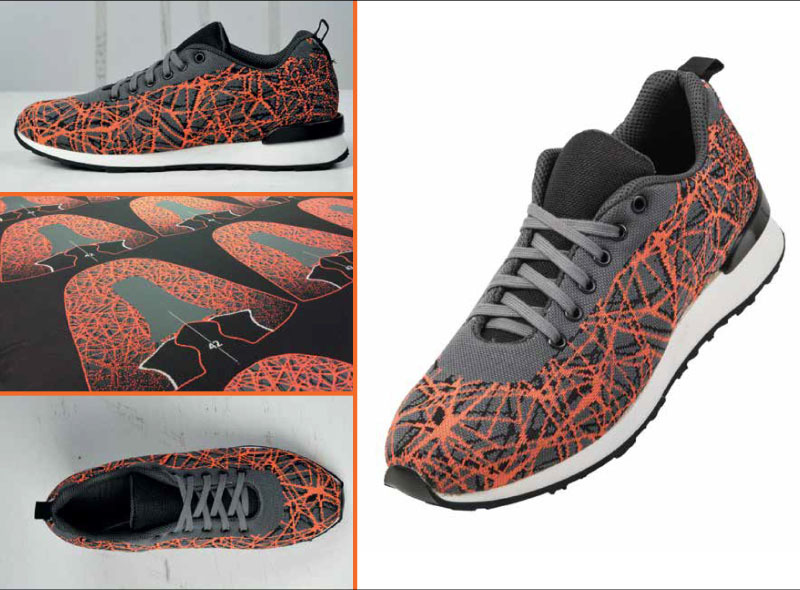 Designed for the footwear industry are suitable for use in many other applications such as: orthopaedics, for padded clothing and personal protective equipment, production of mattresses and upholstery. • Shock-Absorber: Foams particularly suitable to absorb impact shock. The Research and Development of the LTA has created the felts NO FLAME: an innovative range of non-woven fabrics inherently flame-resistant, which do not contain chemical additives or flame retardant compounds and are free of asbestos or other fibres with “mandatory labelling”. In the range of our NO FLAME materials are particularly suited and qualified for use as fire barrier in the sector of public transport, with particular reference to rail and air transport. The fire resistance makes them ideal materials for the production of flame retardant upholstery for public buildings such as cinemas and theatres. The range is completed by a line of materials conceived for the realization of clothing or safety devices intended to safety clothing and/or uniform for firemen and police. 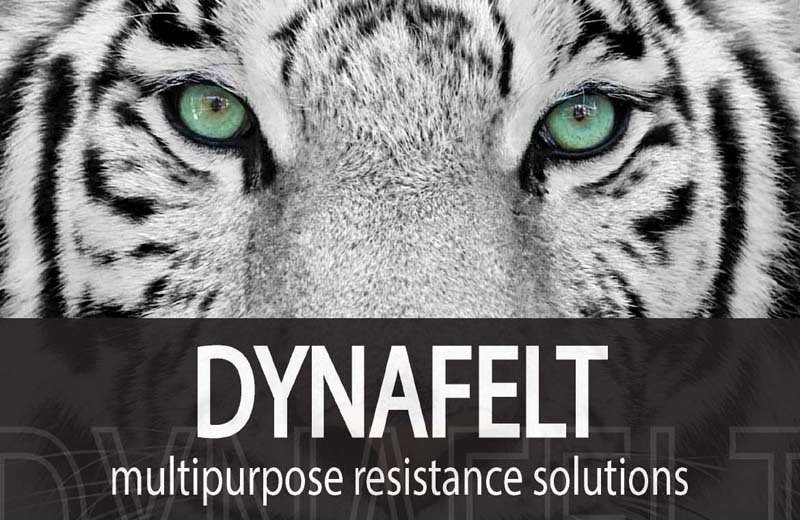 LTA srl offers a wide range of felts made of ballistic tech-fibres, specially designed for the personal protection. 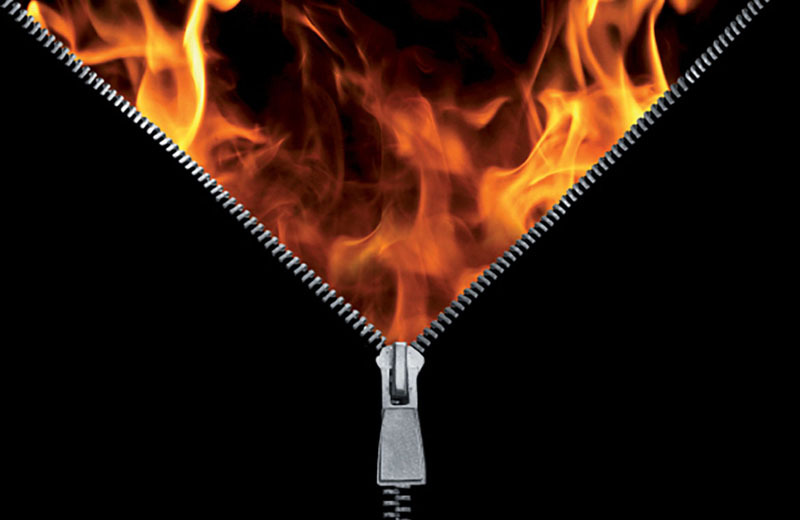 They are textile materials made in various weights using: Para and Meta Aramid fibres (such as Kevlar, Twaron or Nomex) and UHMWPE fibres (such as Dyneema) that due to their characteristics may be successfully used for the realization of protective devices and personal protective clothing, with cut-resistant or fire proof behaviours, or even capable of resisting the penetration of shot-gun pellets or fragments of small dimensions, typically the pellets fired from hunting weapons or the fragmentation shards. 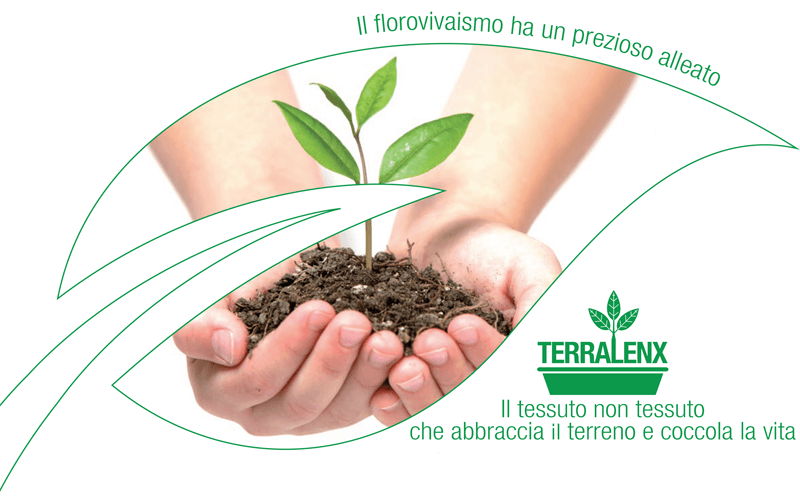 Terralenx® is the innovative material for the protection and development of plants in nurseries and gardens. Made of natural fibres and super absorbent fibres, mechanically bonded, Terralenx® is an ideal Agro-textile fabric ideal to reduce both weeds and water consumption. Importantly Terralenx® is free of chemical binders and complies with the European regulations relating to hazardous substances. Terralenx® finds its principal use in the horticultural industry, it is available either in rolls or in disks ready for use. • Ideal for professional nurseries and for the construction of the Roof Gardens and Vertical Green.